The past is history, the future is a mystery, today is a gift. That is why it is called The Present. I don’t know who first said this quote, but I do remember hearing it in the movie Kung Fu Panda (amazon.com link). It came to mind, and I jotted it down, when I read another blogger’s post on Wednesday. I was planning to open this post with it today. Then yesterday, at our homeschool group, one of the older boys mentioned the same quote. It was a confirmation that this is something I need to dig into, in my life. The thought-provoking blog post I read came from a blogger who has an older girl in school, a cheerleader, and she is a pastor’s wife. I am a homeschool mom with a husband in the military. In other words, in some ways our lives are very different. But Teri Lynne really loves the Lord and desires to follow Him closely. So we have our love of the Lord and of His Word in common. Her words struck a cord with me this week; the post was called Be Present…Don’t Wish Today Away (this link takes you to her website). Even though her life experiences are different from mine, I am experiencing the same call: be present! And so I thought, maybe you are feeling this too? Some of us, we need to learn how to live in the moment. I have written about this before, about Staying in the Measure. Sometimes I worry about the future and it really gets me down. My mom is still early in her first “five years” out of ovarian cancer…and I hold my breath every time she has a test. We live so far from my parents – I don’t know how we can ever get back all this time we are missing with them…But I am clinging to our God because He can restore the years that the locusts have eaten (Joel 2:25). I find myself wishing I could speed through this time away from our family. Our nieces and nephews have become grown-ups overnight. I find myself constantly thinking about the future when we can move closer to all of them. Sometimes I fret about the time that is passing, about the things that are getting away from me. I just realized that my “little” girl, turning 11 soon, is more than half way gone. What can I do to hold on to this time…and slow it down? How can I squeeze more out of these days we have together when I am so busy with the busyness of life? I am filled with regret. But I know all of this grieving about time spent or lost or wasted, and all of the discomfort of missing my family, and all of my wanting to rush ahead…all of this…is sin. This lamenting and wishing, it just separates me from God, and what separates us from God is sin. When I worry about what is to come or grieve about what is lost, I have taken my eyes off of God and put them squarely on me. And there can be no peace or joy in a woman whose eyes are on herself. I think about words a lot. I am a writer and thinking about words is how I make sense of life. So I pondered these questions: How can I learn to to live in the moment? How can I learn to be present? And I realized that to be present is to be like Him – He is I AM. Our God exists in the present tense, always. He is the author of time. He exists outside of time. In the past He is I AM; in the future He is I AM. To be fully present, we must be unified with Him. To be unified with Him, we must submit to Him (John 15:14, 1 John 5:3). 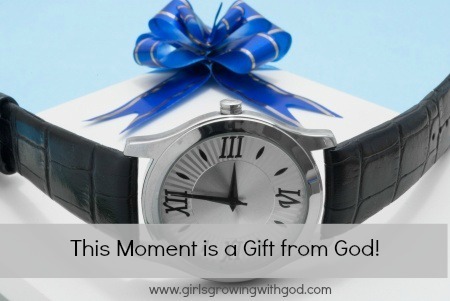 The present is a gift from God – we are not guaranteed even a single second in life, much less a brand spanking new day. So remembering that THIS day is a gift fills me with gratitude. And a grateful heart allows me to more fully experience Yahweh, Who always lives in the present. He is the Great I Am. For once, I am out of words. But I want to explore the idea of living in the present next time too. Can you tell me now, how can you begin to see the Present as a gift? Are you able to submit to the Great I Am so that you can “just be”? Or are you like me, still practicing? This blessed me so much! Thank you, Britta, for your heart and longing to seek the face of God in all things.